The taking of the Three Refuges in the Buddha, Dhamma and Sangha is a traditional indication of what it means to be a Buddhist. In this talk, Ajahn Vayama outlines what it means to take the Three Refuges and live life as a Buddhist. For nearly all of the past 14 months we've been posting a new dhamma talk nearly every day. Over the next 5 weeks we need to redirect our energies to a getting a new website up and running for the Buddhist Society of Western Australia, and as a result, there won't be so many posts coming through on the podcast during this period. But stay tuned as there's much to look forward to as the monks and nuns will be giving new dhamma talks starting in October, and a new website to be released in November. Is it possible to have your cake and eat it too? Ajahn Brahm reveals the answer. Ajahn Brahm talks about where self-hatred comes from and how to find freedom from self-hatred. Assumptions can get us in to trouble, often because they end up being wrong. Ajahn Brahm talks about the dangers of assumptions, and how to avoid them. The key to religion, to compassion and spirituality isn't about focusing on just ourselves, nor just on focusing on others, but focusing on the space in between and how we relate to one another. Ajahn Brahm offers a fresh perspective on developing the spiritual path. We all want praise and to avoid blame. But no matter what we do, we get some blame and never quite enough praise. Ajahn Brahm talks about the fickle nature of praise and blame and how to be calm and unmoved by both. The body can cause us all sorts of trouble, especially when we don't have the body that we want! Ajahn Brahm talks about the Buddhist attitude to the human body and the connection between the body and mind. Ajahn Vayama teaches on how to make peace with the conditions present in meditation, whatever they may be. 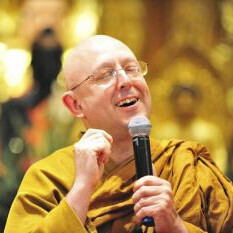 Guest monk Ajahn Munindo gives a humourous and wise talk about cultivating the spiritual life - complete with its many unexpected twists! Impatience can cause all sorts of problems in our lives, and the Buddha said that patience is the highest of the spiritual qualities. Moreover Buddhism always emphasises the importance of patience - they understand that there are many lives after all! So if you're in a hurry to get enlightened, don't forget to go slowly. Sit back, relax and enjoy this talk about patience. Ajahn Brahm offers a practical and wise attitude to life, including how to let go of painful experiences. We can't control everything that happens to ourselves and others in the world, but we can impact upon how we choose to look at it. Ajahn Brahm explains how to have a wise attitude to life. The Buddha said that "the mind is the forerunner" to all thought, speech and action. Ajahn Vayama talks about how Buddhist practice helps us to see directly how the mind is the forerunner of all actions of body, speech and mind, and to train the mind to act skillfully in order to avoid the painful consequences of karma, and to cultivate the pleasant consequences of skillful karma. Ajahn Brahm talks about the nature of consciousness. Ajahn Vayama gives an uplifting talk about the benefits of developing the mind through generosity, virtue and meditation. As she explains, the benefit of practice isn't about changing the world for the better, but about the inner transformation - the miracle in the heart. Doubt is a big problem in many people's lives causing them anxiety and stress. Ajahn Brahm talks about what doubt is and how to deal effectively with it. What is "good" and "bad", "right" and "wrong", and how are we to understand these moral concepts really mean? Ajahn Brahm offers a Buddhist persective. Ajahn Vayama tells stories from the time of the Buddha about the Awakened Nuns and what they can teach us today. Ajahn Brahm talks about mental illness from a Buddhist perspective. Rebirth isn't just a fundamental teaching of Buddhism, but also a very useful teaching that helps us see the BIG picture, not just of one life, but of many lives. It can help us to understand where we've come from, how we've developed certain characteristics and tendencies, and where we're going. Equipped with modern evidence about the reality of rebirth, Ajahn Brahm gives a talk about the nature and value of the teaching of rebirth.